I don’t understand it. Never have—my fascination with spiritual stuff. But I’m not so much interested in a god or gods and goddesses, but more the notion that there is “something” out there “somewhere” that is so much larger than we can imagine, and is capable of…well, just about anything you can imagine: destroying all the dinosaurs by tossing a pebble at the planet; shape-shifting itself into a swan and molesting a beautiful mortal; forcing one man to believe a flood is coming and loading two of everything onto a big reed boat; or, getting jealous, lopping off the head of his son, bringing the son back to life, and attaching to the boy’s body the head of an elephant in place of the boy’s ruined head; or, creating new stars in a place called The Pillars of Creation. When I travel, I am likely to buy a souvenir of the trip. If I’m travelling for a long period, say two to six months or so, whatever I buy necessarily will be fairly small and light weight; small enough to fit in my bag, and light enough to haul around. However, for many years, I had been looking at and coveting, and pricing, large statues: wood, metal, stone. I wanted one to put outside in my garden. But I had no garden, and no stationary home. Still, I looked. 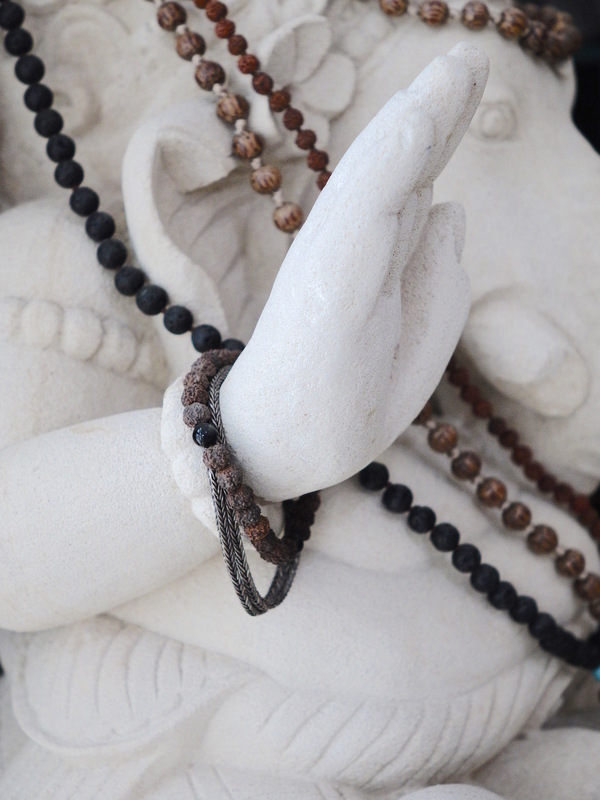 On one trip, I found a statue of Ganesha that was so uniquely different than any other statue I’d seen of him, much different than the traditional style, I fell instantly in love with it. It was carved from sandstone, so it was heavy. I mean real heavy. Heavy and fragile, perhaps like many gods. And too large for my pack. It took me a month of back-and-forth, trying to decide (I have trouble making decisions, especially on large purchases), but one day, I woke up listening to my gut. I went to the sculptor’s studio and paid cash for that slab of stone, and shipped it home by boat. This is actually a very long story (which I’ll share another time). Long story short (and spoiler for that long story): when I pried open the box and unwrapped the statue, I was horrified. Heart sick. Depressed. Shattered. They—the “professional” packers—had put the statue in a wooden crate and wrapped it in one layer of bubble wrap. One. Layer. Lord Ganesha was chipped in numerous places, both tusks were snapped off. His right hand was lying at his feet inside the one sheet of bubble wrap and surrounded by pieces of chipped stone. The toes on his left foot were chipped (and his toes are one of the greatest features on this statue, so nicely designed). In the pantheon of Hindu gods, Lord Ganesha is the lord of prosperity, fortune and success, the lord of beginnings and remover of obstacles. But apparently, unable to protect himself from a crate packer just learning his trade. I glued one tusk back on, couldn’t bring myself to glue the other one on because the first one just didn’t look right. In the Ganesha myth, he has one broken tusk (part of that longer story I’m not telling now), so I’m figuring, fine, that’s his broken tusk. I glued his hand back on and covered the area with a couple of spiritual bracelets. I covered his chipped toes with a few tassels from the prayer beads I hung on him. In many spiritual texts, you might find some advice telling you to find peace in things. And maybe that one way to find peace in things is by accepting what is, and to make the most of what is. A rose is yellow, not red. It’s raining on the day you planned a walk on the beach. The grocery store is out of lemons, make lime juice smoothies. And nothing is perfect. Unless you believe everything is perfect. I have been aware of this concept for years, decades really. I understand this concept. I have practiced this concept. When something doesn’t go the way I planned, I try to find the positive side of things. 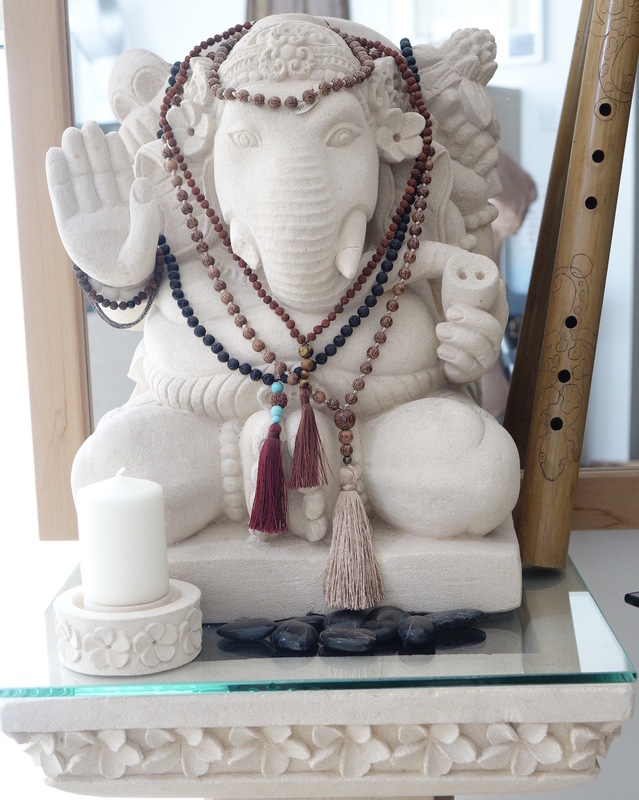 When I look at my stone statue of Ganesha, I accept that it is what it is. The right hand seems fine, but I know there’s a flaw at the wrist. The left tusk looks okay from a distance, but the seam reveals a gap in the stone, where glued together, when you approach closer. The right tusk remains unrepaired, displaying the uneven break. All easy enough to overlook. But you know something is not right with the gods. I try to imagine this is the way it is supposed to be. I’d like to say I have accepted things as they are. I can love that statue for what it is. Most days, I can imagine that I believe that I have grown spiritually and may be a little further along toward Enlightenment on a scale from 1 to 10. But on other days, I look at Ganesha—and I’m sorry to report—I’m disappointed. I’m apparently stuck somewhere in my lowest chakra, the muladhara chakra, possibly huddling around a .5 on the scale of Enlightenment growth. Whatever that great “something” out there is, it must be disappointed in me. Because I admit: I have not quite totally accepted things as they are with Lord Ganesha. Sometimes, perhaps, even though you know it may have flaws, you just want to believe your god is perfect. Next 2 Good Reasons for Everything: On the Way to Where? Fascinating story ! Your Lord Ganesha is beautiful, regardless of the cracks. It may not be easy (he’s a god after all), but I think you are in good company. Thanks, Ada. I think you’re right–I’m in good company, no matter the flaws. Maybe flaws are part of perfection? Great story. It is hard some days to se good things in life and other days it is easy. Isn’t that part of what life is all about? Trying to find piece and balance in our souls no matter what? Lena, I’m guessing you are right–good and bad days, and finding balance in our souls (very nicely said!). Sometimes easy, sometimes not so easy. Yeah, that is life, I’m guessing. Wow Badfish, another riveting post from you. Your Ganesh is certainly beautiful, and unique. I love his buddha belly. So much in your post I dont really know where to begin! I’ll start with saying I am glad someone else shares my decision-making issues. 🙂 A Daoist friend of mine once told me that once a spirtual icon gets broken one can’t ‘use’ it anymore, that it can’t be on the Altar, and that one should throw it away. I had a beautiful statue, which had been on my Altar, it fell and broke. it was so beautiful I couldn’t bear to part with it. So I kept it as a kind of art/decoration. My friend wasn’t so happy but as long as it wasn’t on the Altar, it was okay in her eyes. Your Lord Ganesh – well, he does have one broken tusk, after all you said, so that fits. He is still so beautiful and obviously loved. I don’t think there is anything wrong with still feeling some disappointment with your Ganesh – after all, you spent a long time debating with yourself whether you should bring him home, till you could no longer fight your intution and woke up one day and made friends with him. paid good money, shipped him home. and he was sooo heavy, right? a bit effort. to find it broken – what a heartache. you did the best you could. 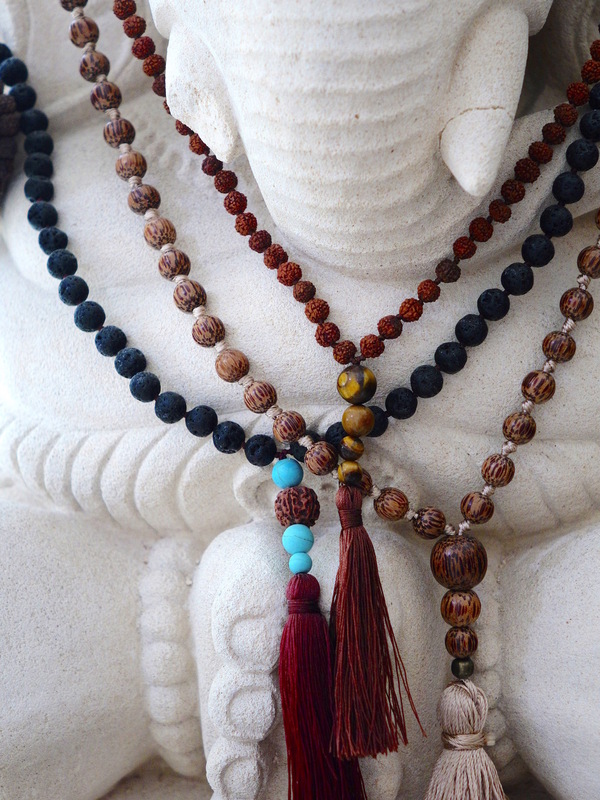 have you thought about finding another representation of Ganesh to accompany this marvellous fellow you have? I don’t think your dissapointment is connected with lower chakra at all – what it does say is that you were really connected to this representation of a God and you also appreciate beauty. Great, though provoking post. Thank you. Ha! Right you are. Maybe all is right in the world, after all? The perils of packing. I’ve had some important things arrive broken too. Right. And jeesh…you’d think “professionals” who do it daily should get it right, eh? Thanks for visiting and commenting! Yeah, that’s an interesting take on things, makes perfect sense. Maybe they live in another dimension…without bodies, or brains. Just essence of being. I like the concept that there is “something else” out there, and I really like the idea that they can sometimes help us in this world. I know that I get helped all the time, little things usually, that help me through the day. Some might call it “coincidence,” but I don’t know. “Miracle” is more like what it seems to me. Reading your posts always asks for a cup of tea and a comfortable place to sit, because I know we will be treated to superior writing and photos, encompassing a fascinating story. Today was no exception. I loved your post. But I am also very happy to see you back to blogging. Have missed you here. Besides, I’m very curious to know if your absence has anything to do with the arrival of your iphone6. Are you in love with it and cannot do anything else but enjoy your smartphones ? Lucile, thanks so much again. Yeah, I feel almost guilty for leaving the scene of this accident for a couple of weeks. I’ve been really, really busy at work. I had no energy (nor time) to sit and write. I couldn’t even read other people’s posts. I had no intention of writing this week either. Then I noticed the DP Photo Challenge post, noticed it was “Broken.” Thought–yeah, I should do broken. Looked around. Ganesha lightened the room. I stood in front of him and touched each of his broken bits. I can’t say I shed a tear (I am a man, remember), but something inside of me felt very…soft. iPhone 6…OK, you’re not going to be so proud of me. I haven’t used it once. I think there’s something wrong with it. It doesn’t turn on when I press the button. I plug it in and it turns on. And yes, I charged it to full. I haven’t set it up yet. That may be the problem. I’m afraid to set it up by myself. I have never changed a sim card! BUT…I plan to go to the iPhone store TODAY to get help. We’ll see if that works out. But a part of me wonders if the gods are not smiling at your acceptance of the imperfect..as we all are. Lois, Ha! We can only hope the gods are smiling…for any reason! I’m told Native Americans used to weave in an “imperfection” as they believed nothing was perfect, and everything was. I like the concept. Not quite there yet. Wonderful post in every way. It reminds me a little of my “broken” Buddha head (a long story in itself), which I wrote about recently, but your post is much better! Thanks for a great story. Lex, thanks so much for visiting. I just read your Buddha head story, and I have to say your story is truly marvelous. How heavy is that head? I’m bad at estimating weights, but I’d say 5 pounds, maybe? Quite heavy for something that’s only about 8-9 inches tall. Thanks again for the visit! Cool. It’s a very nice piece…er…actual Buddha. I have to admit that the disappointment would drive me insane … it would always be like a burr under my shirt. I guess my enlightenment is a degree or two lower than yours. Joanne, I know, right…a burr under your shirt. Me too. Can’t a god get things right once in a while. Jeesh! What’s so hard about getting yourself shipped half-way around the world in good condition. I can’t explain why, but I think your Ganesha is more ‘perfect’ with all the breaks – a symbol of the ‘imperfection’ in All That Is. After all perfection is only a concept, and is in the eye of the beholder n’est pas? Also it’s a reflection of your own perfect imperfection. Perhaps that’s what you’re disappointed with. If you’re okay with feeling disappointed have at it. If you’d like to not feel disappointed any more get into the feeling of disappointment within yourself and then say Creator (or whatever it is, but you have to admit it’s pretty creative) I am sorry, forgive me, I love you and I thank you. Say it slowly and mean it! What you are sorry for, who/what you love, who /what you are thanking – that’s for you to discover when you say the prayer. Finally – There is nothing out there! It’s all within you. When I discovered this at a visceral level, had the lived experience of it, I fell to my knees and kind of cracked open, elated and terrified at the same time. It was a while ago now, and I have to remind myself of it these days, but you can’t unknow what you know. PS We are going to be in Turkey in Sept, Jordan and Egypt in Oct – it’s close to you – any chance we could meet up?????? OMG I just re-read this and it sounds as if I’m lecturing you, or preaching a sermon or something. Sorry. Cringing now. Alison, I didn’t read it like that at all?? Offering insight is a far cry from a lecture. Oh, and one more thing. I remember a famous guru saying something like it was OK to experience all your emotions–we have them for a reason. But to experience them and then let them go. Which is pretty much what you are saying…and offering a method for the letting go part…which is the dang-hard part. You always have such an interesting, and spiritual, take on things. And I almost feel the same about Ganesha’s imperfections. It’s funny, but a number of things I have purchased on my travels have been broken already (the tile from Amsterdam…I could have bought a whole one; a spur from Peru; a torn sari from India). So for some reason (maybe the same reason that you are unaware of?) I am attracted to the imperfections in things. And for years, or decades, I have been aware of the concept of “acceptance of what is.” But apparently, I am far from being enlightened. I was so disappointed when I first opened the crate and saw a ruined god. I didn’t even take him out of the bubble wrap for over a week. And then, I did. And then I put him on the altar I’d also had shipped (which also got chipped). I did not, however, even think about calling the shipping company. That Ganesha was not just a statue, he was my Ganesha. If I’m being truthful, I would have preferred him unchipped, unbroken. But there is something to be said for “character.” And if it takes Ganesha to move me one step closer to accepting what is, then fine. Reading this I get the feeling again, and I don’t know why, that your Ganesha is so much better (for you!) with it’s imperfections than it would have been if you had taken it out of the crate undamaged. In that case it would have been just an idol. Being broken made it personal and connected you with it in a much deeper way. Yeah, I think I agree with you. I think I am more attached to it now. Blood brothers, or spiritual brothers, or…? There is definitely a link, stronger than before. Interesting that you “see” that (and don’t know why!). And get this…because tourists didn’t understand Ganesha had a broken tusk, they ended up not buying a statue because the tusks were “uneven.” So sculptors in Bali started making both tusks even, or really close, and not lopped off square at the end of one. So now mine…actually has the proper broken tusk!! Things are right in the universe. I’ve just checked my calendar: I believe I will have 22–26 Sep off work. Maybe that whole week? I missed Cappadocia in Turkey, maybe I can meet you there. I did the Nile cruise, and don’t ever need to return to Cairo as I got a good shot of the pyramids (and don’t want to experience that traffic again). Get a guide with a car. I did, however, miss Abu Simbel…I could see flying in there for a weekend jaunt, maybe. If none of that works out, maybe you’d like to see just how fast the fastest roller coaster in the world is…at Ferrari World Abu Dhabi??? Or see the tallest structure in the world in Dubai?? Wonderful! Glad to have you back! Yes, I think in our flawed selves we seek perfection. Be it a broken spirit or broken heart, we seek healing, to be whole. Jo, thanks so much for visiting again. I was busy for a couple weeks. And I still need to file my taxes! Healing…yeah…who doesn’t want to be whole? Feeling happy to see a post from you! Knowing the story is quite longer, I still traverse the ups and downs, the perils of being disappointed, and the frustration of wondering why it is things are not perfect, as we want them to be. Then I think, perhaps Lord Ganesha seeks to help you accept imperfection, a sacrifice of his own, to guide you through the terraces of your own broken places. Does disappointment translate as having less love for Ganesha himself? I wouldn’t think so. Though only you have that answer. You loved him so much you wanted to bring him home, and are thus being asked to release expectation, and embrace imperfection, as Alison said, since Ganesha is the symbol of imperfection. Think of the irony of wanting a perfect imperfection… and not accepting imperfection as perfect. The pictures are great. The way you sought to cover up the imperfect imperfections is very creative. I hope your journeys have been fulfilling. Your presence is missed here. Fim Noir, I have truly missed your avatar and wit ( and little orange comment bubbles on my blog). Things got in the way of blog stuff. Blogging—to half-quote Betty Davis—“is not for sissies.” You need commitment. You need time. You need energy. You need a secretary. You need an IT department. You need an agent. You need more freakin hours in a day. You need an espresso machine in your home office (no time to walk to the kitchen). And you are right (and spooky) once again. Ganesha surely was meant to help guide me “through the terraces” of my own broken places. Crikey, woman, you should be a poet. Oh wait a minute. You are. And you’re right about my not loving him less. I never thought of replacing him for another statue. And irony: right. How ironic. Or is it even ironic at all, I wonder. Maybe that is just the way things are, and the comos’ way of offering you a lesson? But yeah, still freakin ironic. Gods are dicks some times. It’s so good to be able to comment here! I’ve missed it. I already said that but it bears repeating. 🙂 Were you doing something that was fulfilling while you were busy? Because that’s what I hope. I have pretty much given up everything else to stay and blog. BUT, then again, this is my year of The Lovers, an that means follow my passions. So I am. Except, now I’m coming up on the end of Story A Day in May and I’m starting to panic! What will I write about? On the other hand, it occurs to me that this is the time for me to be outside, in the light, communing with the Green Ones. This is crazy making. I don’t know if you got my ping, about being one of 5 neighbors who I totally enjoying hanging with, but it should show up somewhere. you make me laugh… we need for of that! Fim: doing something fulfilling? Hmmmm. No. Can’t say it was fulfilling in the sense you are talking. Work, these days, is work, and not a passion anymore, sadly I confess. Just work, going through the motions, trying to–if not love it, at least–like it. But it’s not me writing or traveling or photo-ing, so no love happening. It’s hard to love a drudge. Harder to love a drudge that shouldn’t be a drudge. And yes, I can see you are becoming quite the every-day blogging fool, Missy! And it pains me to not be able to open and read and enjoy and like and comment on your (and some other people’s) posts. It pains me more to delete them from my inbox without even having read them. But summer’s coming. Light at the end of that tunnel up there. I did not get a ping, or rather, I have not discovered where it is (does it go to email?…which I probably deleted). Can you send me your link? I may be busy, but I’m still ego-centered enough to want to see my name on your dang blog. And flattered to be one of five to hang. But still, my ego wants to know if I was number one or three or five on the hierarchy. Probably that pesky Calensariel was number one, I’m guessing (she’s so good at commenting to you! fun to read your back & forth). I also thought I’d answered it. I don’t know actually how or where a ping shows up. I thought it would show up on your blog somewhere. I remember re-blogging one of your posts. That may have showed up in your comments on that particular post. Maybe if I do the ping to your main/home page, it shows up there? I think you and I do pretty damned good at a back and forth with each other. IMO. I can relate to the drudge… but some times just to shake things up, I try to see the drudge as a time to be mindful. Sometimes it works. Still, as the summer moves in, it sounds like you might be on the move again. That would be nice! That would make you happy. YAY@ being happy. Going to go check where you ping might have landed here on your blog. Will let you know if I find anything. I think I usually get a “ping” notice in my orange talk bubble drop down. But I didn’t for yours. I did click the link on your blog and it brought me to me. So… another spooky thing? Thanks Yvette, and thanks for visiting again. Glad you liked my lines, even if I’m not sure where I stand with the concepts! I’d be gutted but he is still beautiful – my favourite Hindu god! Yeah, like they say: beauty is in the eye of the beholder. And apparently, Ganesha is many people’s favorite. What’s not to like? Except that rat he rides around on! I enjoy your thought processes and fully relate to your overriding disappointment when a beautiful possession is damaged. Someone, I’m glad you can at least even follow my thought processes! Sometimes, I get lost in them. Thanks for visiting and commenting. Thanks so much for visiting and commenting. I like that you think it’s “moving upwards on the enlightenment scale.” After all this time and now entertaining all these various thoughts, I feel some how closer to my Ganesha. So thanks for that, too. That is the point. Just because the idol has a scratch or dent does not mean that its Godliness lessens…. 🙂 it is a spiritual connection! I agree totally. Perhaps the connection now runs deeper, stronger (as Alison mentioned above)? Get this: I have been thinking so much about this, that I have thought about a number of “things” I would have liked to have included in the story (or maybe that is part of the longer story?). Thanks again. I stopped by to say thank you for following my blog and found your really thought-provoking post! If I can add my 2 pence worth, I’ve come to believe that perfection just doesn’t exist and more importantly the search for it blinds us to more important things – I think the faults and the imperfections of life have their own beauty and it’s finding the harmony in all life’s opposing forces that counts. Hope you don’t mind that lot for a first comment !! Jane, thanks for discovering my blog, and commenting with such a lovely response…your two-pence, or twenty, is always welcome! And I think I have to agree with you…what is perfection and how would one really judge it? Maybe what matters is the whole of life, good and bad, perfectness and imperfections? Po…Ha! That’s a good moral. When I find one of those, I’ll let you know! I enjoyed reading this post. A Ganesh statue should have on tusk broken at the root as methodologically he lost his tusk. That is why Ganesh is also called as ek-dant (one-tusk). Thanks for visiting and commenting! You are right that Ganesh needs a broken tusk, so I guess all is well in the cosmos since mine now does, also. Hey Jude, HA! Yeah, it does look like a pipe in the photo! And I too relate to Ganesha more than some others—I mean who wants, say, “The Destroyer” in your house? Thanks for hanging out here. What I really liked about it was the way you decided to ‘Stand in the cause of the matter’ and shifted out from being a victim of circumstances. That is a great leadership and ‘way of life’ perspective. You now also know ( though you did not allude to it in the post) the kind of precautions you would be taking when you decide to ship another statue for your non-existent ( as yet!) garden. Shakti, You are the first person who actually mentioned the idea (irony?) of my “nonexistent” garden. I thought buying it was so odd…since I had no place to put it! Thanks for the positive response: I don’t feel like a victim nor “leader. But it feels like a good way to attack life. Who really needs to be a victim, especially of their own doing? Want, buy, pack, break, resent, accept. You capture much of what we are and what we do. Greetings from my dime store Ganesh to your glorious Sandstone. I’m with Alison and Don above — nothing out there in the sense of a god or gods looking down on us humans and pulling the strings, but definitely something out there in the sense that we are part of something bigger than we are. My Ganesh figurine graces an altar a friend made for me, and both are right next to my desk, along with shells, agates and other trinkets. They remind me, or I so I tell myself, that I am not in control of the important things. OK, pretty much not in control of anything. Anyway, what better reminder that we aren’t in control than a broken tusk and chipped toes? Also, sandstone, which wears away more quickly than granite or marble? You are on the road, man! To enlightenment and a rapid ascension through all chakras. Tell us what it’s like when you get there. JB, Haha! I think I’ve been on this road quite a long time. It is either a very long, and bumpy, road, or I am a very slow mover. And I’m pretty sure my kundalini is puddling around my lowest chakra. But ok, since you asked, if it starts to rise, I will let you know! But as they like to say: don’t hold your breath. Some of the things that have broken bother me so much, I throw them out. Other times I gather up the pieces and glue them back together. I did that with a fragile ceramic compote complete with lacy floral details and cupid. I glued the whole shattered mess back together when I was having a tough time. It became a metaphor for life! Yeah, I know what you mean. I guess I’m lucky it was just a few big pieces instead of the whole thing being shattered. Always something positive to look at in life! And you have a way of doing that all the time. Wow! When you find your moment, you really do it up right. Broken…I’ve seen pictures, I’ve seen paragraphs, but never have I seen a post like this for the prompt. How awesome this is. I love your thought process and how you can write it all down and make it understood exactly where you’re standing. But I will say this about your Ganesh……I have a mother who really dislikes all the wrinkles and lines on her face and has mentioned plastic surgery more than one. But to me, those lines and wrinkles are “battle scars” partially created, I’m sure, from the worry her children put her through over the years……flattening them out would erase some of the lines I’m sure, but it would also take away a very visible reminder of where my mother has been in her life if you know what I mean. There is a reason we age and I, for one, think we should embrace that and celebrate those lines and battle scars because it means we’ve lived, we’ve made a difference somewhere, we’ve experienced. I think it’s the same for your Ganesh…it’s part of his journey (and yours) that he has some imperfections…if he were perfect, he wouldn’t really be yours…..those imperfections came to him getting to you, you know? A….thank you so much for visiting and for that lovely comment. I’m so glad you can follow my thoughts. In face-to-face encounters, I get lost. So, on paper (or cyberville), I’m thrilled when someone says they can actually understand, and follow, what I’m saying. And I guess I have to agree with the battle scars concept. Ganesha, and your mother (and most of the rest of us) look like who we are because of who we are, I guess. And that’s a good thing. So I feel a little lighter about a “wrinkled” Ganesha.